Klangbad: Avant-Garde in the Meadows/ Faust: Live at Klangbad Festival Play Loud! This is two films on one DVD documenting performances at the second Klangbad festival, held outside the quiet German village of Scheer (where the Klangbad label is based) in 2005. The first film 'Klangbad: avant-garde in the meadows' is 85 minutes of performances from nine artists - I use the terms 'performances' and 'artists' advisedly - including the legendary Faust. 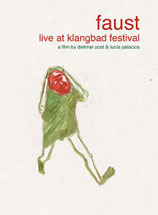 The second film 'Faust: live at Klangbad festival' is 70 minutes of the Faust set from the same festival. The connection between the two films is one Hans Joachim Irmler, founder and current member of Faust, who runs the Klangbad record label and curates the festival. He invited the film-makers (a crew of three) to film the event: their approach was to be simple and direct, economic and non-tricksy, in the manner of the 'Direct Cinema' of the 60s, an approach consistent with the festival itself. You could come to these films cold, without any prior knowledge or background, ears and minds open. I suspect that this is something that Irmler/Klangbad would approve of; there is something free, experimental and downright unashamedly hippyish about the festival (which is non-corporate and sponsor-free), where anything seems to go. "Music is a form of communication" someone says. Throw away preconceptions, open yourself to possibilities, it seems to say. In 2005, the 3 day festival is small, with one stage set in a wood, people sleeping in tents or hammocks down by the stream, drinking German beer and eating sausages. There is a naiveness about it - of a bygone era - and of the performances themselves which vary widely. There's the doleful (Death in Vegas-ish) electronica of duo Minit, the 60/70s politico-art proclamation from Jutta Koether, Steven Lobdell bangin' a gong (or hubcap) through effects to create something trippy and transcendental, Cpt Howdy's take on american garage rock, Circle's mesmerising mishmash of groove and heavy/death metal with looks to match (bizarre), the country-like mix of reed organ, double-bass and slide guitar of Kamerflimmr Kollektief-Hausen, the acoustic folk of Scotland's The One Ensemble of Daniel Padden, and the art-school act of Nista Nije Nista, that walks the line between playful and silly and irritating (think Native Hipsters' 'There Goes Concorde Again') and when interviewed they all speak at once in their own languages without looking at each other, one points to the sky and says "Rainbow". And there IS a rainbow in the sky. What a way to end the film. So next to Faust. Do you need/want to know anything about Faust? If not, look away now. They are one of the 'Krautrock' groups - a term coined by the British music press to cover the range of bands emerging from the German music scene in the late 60/70s but not recognised by the bands themselves (who rather saw the term as a pejorative). That collective term ignored the fact that there was no real movement or connection between the bands, who were based in different cities, or even a defining sound, although all seemed preoccupied with creating a new musical identity, rejecting the past and the present (German post-war pop (schlager) and corporate American fodder) and embracing a future through experimentalism and new sounds afforded by the synthesiser and FX. Tangerine Dream, Can, Cluster, Kraftwerk and the proto-punk of Neu! are probably more known and readily available while the likes of Julian Cope faves Ash Ra Tempel not so – which possibly persuaded Stuart Maconie to play their first album in its entirety (two tracks!) on his Freak Zone show recently. Among these, Faust (meaning 'Fist', as well connotations of Faustian pact with the Devil) emerged, becoming John Peel favourites and surprisingly popular (being picked up first by Polydor and then by the fledgling Virgin label), with an artful, playful but uncompromising approach to making music. This left the listener unsure where the music was going or where the sound came from. And perhaps it was no coincidence that it was Faust who responded to the Krautrock term by throwing it back at the British press with their mighty drone-based instrumental 'Krautrock' (Faust IV). Brilliant and awful music was made during this time. Whether it was brilliant or awful didn't seem to matter. It was the fact that it could be done. Is that a hippy or punk attitude? Does it matter? But good things come to an end and groups split (Neu! split and elements became La Dusseldorf and Harmonia), Can went from a prog to a funky groove, Kraftwerk abandoned their experimental edge for listener-friendly synth-pop, while Tangerine Dream became corporate behemoths (and in every student's collection alongside Pink Floyd). Faust quietly faded away. Punk came and went. New Romanticism, Mod/Ska revivals, Rough Trade, Acid, Madchester, Grunge all raised their heads and then nodded off (ok Indie still snoozes along). But then Faust re-emerged - as two groups. How contrary, but how Faust! Each Faust has original members: one version has the maverick duo of Diermaier and Péron whilst the other is headed by Hans Joachim Irmler. It is the Irmler Faust that released the 'Faust is Last' album earlier this year (and reviewed here on SoundsXP). Irmler has also remixed the re-issue of the one and only Faust 7" (originally released in 1972) 'So far/It's a bit of a pain' (said to be John Peel's favourite Faust track) to coincide with this DVD release (see separate review here). The Klangbad festival started small and is growing but still needs support. If you are interested in finding out more about the festival, or about Klangbad and its artists and recordings, including Faust, follow the links below.